Staffordshire housebuilder Walton Homes is investing more than £150,000 in community enhancements as part of its latest development in the county. 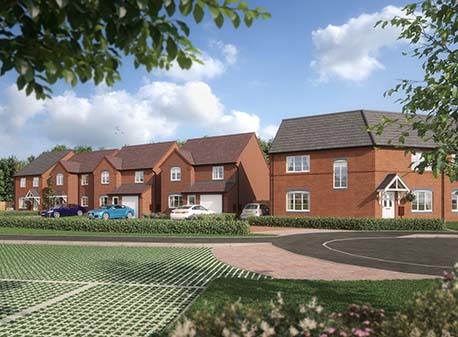 Work is underway at Walton Homes’ newest site, Creswell Croft, on the outskirts of Stafford, which will see 14 new homes created, along with recreational facilities and educational contributions to the area. Located on the border of the historic village of Creswell, off Wooton Drive, the site was selected due to its rural destination adjacent to Doxey Marshes Wildlife and Nature Reserve, and the development of three-bedroom homes is earmarked for public launch on December 6th. The launch will include the unveiling of a show-home and sales centre to enable potential buyers to see exactly how the completed homes will look. Amy Summerton, Director, said: “This is a highly sought-after area, offering both a countryside setting and close proximity to the busy town of Stafford and all of its amenities. Creswell Croft will offer six different house-types, each with well-planned, high-specification interiors and traditional facades to ensure that the development complements the local environment. “As part of our investment into the area, we have agreed a number of investments into the region’s facilities in order to enhance them for both new and existing residents. These include contributions of more than £65,000 toward primary and secondary education in the area, and more than £85,500 toward new recreational facilities. “We’re also looking to install new play equipment as part of our commitment to creating community facilities, as well as a new parking area being provided alongside it,” she added. “We are anticipating a great deal of interest in these properties as people look to combine their desire for rural living and town-centre access. The location, combined with the specification of the properties make them very attractive for households of all sizes and we have already received a great deal of enquiries in the development. “The first homes are expected to be delivered before Christmas. For further information on Creswell Croft and the homes available, contact Walton Homes on 01543 412288 or email homes@waltonhomes.co.uk.